Sally Holt, Leigha Miles, and Ashley Bober. Also pictured is George Holt. This time we have three people that have helped during events and volunteer their time to benefit the Snow Shoe Rails to Trails. They are: Sally Holt and her granddaughters Liegha Miles and Ashley Bober have been volunteering at annual SSRT events for the past three years. Leigha and Ashley have been taking care of selling and inventorying the SSRT clothing. Sally helps out wherever needed. They enjoy seeing all the riders, especially the ones that find the mud bogs. Sally retired from the West Branch Area School District in 2006 after 28 years, the last 21 as the secretary of the high school principal. Leigha is in the 11th grade at West Branch Area High School and Ashley is in the 11th grade at Philipsburg-Osceola Area High School. Leigha and Ashley use their volunteer hours toward their community service requirements for graduation and for induction into the National Honor Society. 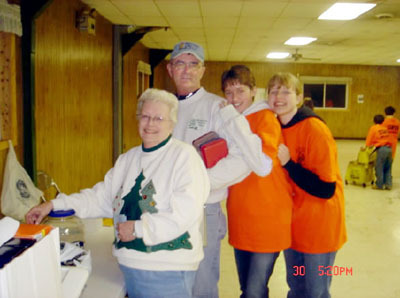 They are three of the many people who volunteer their time to make our events a success. Thank you from all of us!!!!! !